It‘s a high grade spectroradiometer which is suitable for evaluation in each kind of light source and measurement. Those evaluation and measurement are required for high accuracy. This equipment is using 5　monochromators and quintri-farcated fiber which are suitable for　measurement for wide wavelength range. It is possible to measure 5 wavelength areas at the same time. 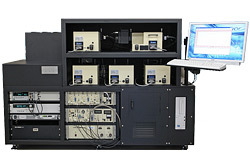 This equipment is used for reference solar cell calibration, primary calibration equipment in AIST and secondary calibration equipment in JET.